Join us over coffee and breakfast for a great morning of networking. Make professional contacts, get to know one another better, and grow your network of business contacts. No formal program or agenda, simply an opportunity to expand professional contacts in the Buffalo area. Be sure to bring plenty of business cards! Mail-in Registration: Please mail your check and business card to TMA Upstate NY Chapter, P.O. Box 2174, Buffalo, NY 14219-2174. 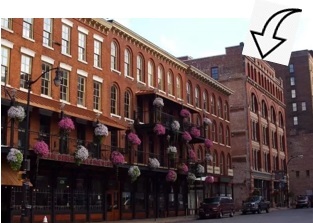 Directions: The Lofts on Pearl is located in the historic Richardson Romanesque J.A. Webb building at 92 Pearl Street, between W. Swan and W. Seneca Streets. It is a red brick building next to the Pearl Street Brewery. Parking: Parking is available on the street, across the street, and in a number of locations close-by. Please click here for specific lots or to make a parking reservation using Parking Panda, or take the Buffalo Metro Rail to the Seneca Station stop. Questions? Please email or call the chapter office at upstateNY@turnaround.org or (716) 440-6615.